Earlier this month two of the three Hamilton County Commissioners rejected a sales tax to repair both Music Hall and Union Terminal. The commission instead approved a five year, quarter-cent sales tax increase for the November ballot, which would fund repairs at Union Terminal only. On Friday, both commissioners, Chris Monzel and Greg Hartmann, issued statements encouraging voters to support the five year sales tax. 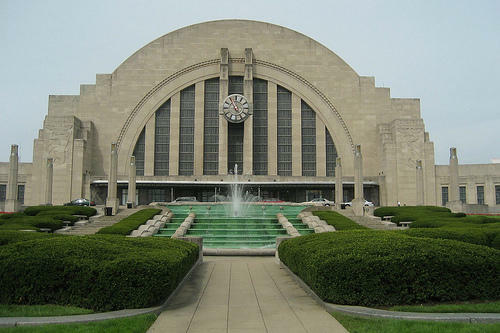 "This is a significant step forward for the future of the Cincinnati Museum Center and is the first step forward in a comprehensive solution for both Union Terminal and Music Hall." While backers of the original plan are throwing their support to the Union Terminal only plan, they are making it clear Music Hall is still a priority. Murray Sinclair is the new chair of the Cultural Facilities Task Force (he's also a Cincinnati Public Radio board member). "The Task Force remains committed to the original charge," says Sinclair, "...until a successful path for funding is secured for both facilities." The Cultural Facilities Task Force had proposed a sales tax increase to renovate both buildings. "This is a significant step forward for the future of the Cincinnati Museum Center and is the first step forward in a comprehensive solution for both Union Terminal and Music Hall," says Cincinnati Museum Center Board of Trustees Chair Francie Hiltz. There was some doubt if the Museum Center Board would endorse the proposal since it did not include the Music Hall piece. The finer funding details are still being worked out. Hamilton County Administrator Christian Sigman is expected to issue a report in 3-4 weeks detailing how the financing will work. As for Music Hall, Sinclair says, "The Task Force is meeting to develop an alternative funding plan to support the Music Hall project and we look forward to sharing those findings with the community in the coming weeks."